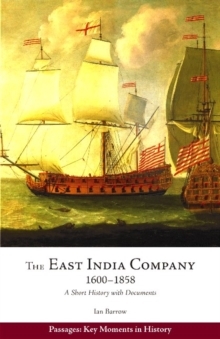 In existence for 258 years, the English East India Company ran a complex, highly integrated global trading network. It supplied the tea for the Boston Tea Party, the cotton textiles used to purchase slaves in Africa, and the opium for China's nineteenth-century addiction. In India it expanded from a few small coastal settlements to govern territories that far exceeded the British Isles in extent and population. It minted coins in its name, established law courts and prisons, and prosecuted wars with one of the world's largest armies. Over time, the Company developed a pronounced and aggressive colonialism that laid the foundation for Britain's Eastern empire. A study of the Company, therefore, is a study of the rise of the modern world. In clear, engaging prose, Ian Barrow sets the rise and fall of the Company into political, economic, and cultural contexts and explains how and why the Company was transformed from a maritime trading entity into a territorial colonial state. Excerpts from eighteen primary documents illustrate the main themes and ideas discussed in the text. Maps, illustrations, a glossary, and a chronology are also included.